Previously we mentioned about Pine Trail as a replacement for existing Intel Atom N270 series processor, now seems that the giant chipmaker has further confirmed the plan during the recent announcement by its General Manager, Al-Khaledy. According to him, the next generation Intel family processors will have significant reduction in both foot print and power consumption that make it even suitable for slimmer netbook and nettop designs with longer battery life. 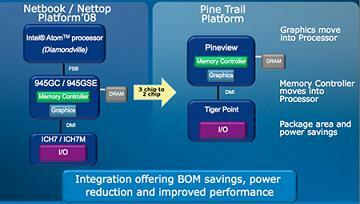 The Pine trail processor will be designed to pair with Tiger Point, an IO chip that able to extend some of its functionality to cater for what is needed for common nettop or netbook segment. Interestingly, some of the major modules such as memory controller and graphics controller will be integrated into its processor core itself, making it a two-chip solutions for much better system performance while able to reduce overall BOM (Bill of Material) cost. If you recall, the first generation Intel Atom Z series processor, codename Silverthorne was paired with US15W but seems that the solution was not preferred by board vendors due to its higher cost as compared to second generation Intel Atom N series processor. Hopefully the upcoming platform solutions will able to satisfy consumers in both performance and cost to continue the great momentum of pushing Intel Atom in market space. Intel spokesperson further confirmed that additional detailed information will be provided during the Computex roadshow held in Taiwan by early next month since the availability will be on second half of this year.